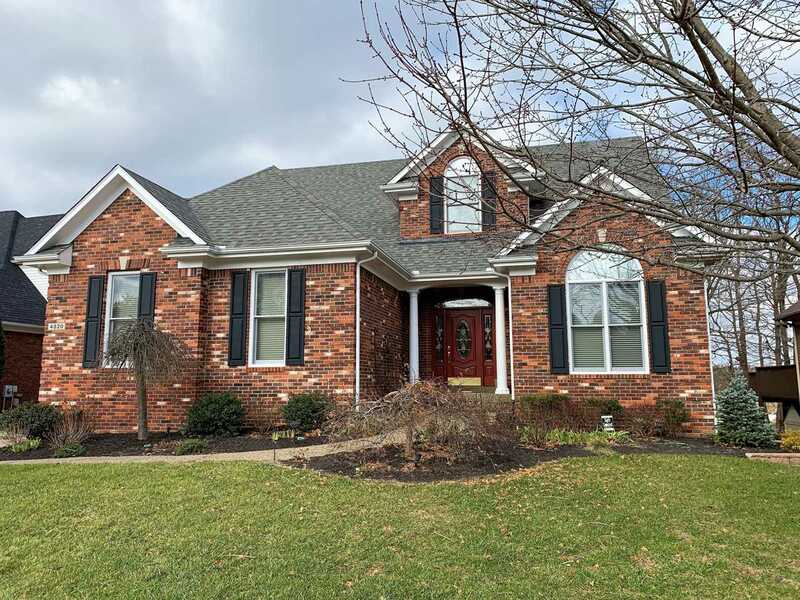 With six bedrooms, an open floor plan, stylish walkout basement and three floors of beautifully-finished living space, this lovely home in Forest Springs North is truly a ''find''! With the master and another bedroom/office on the main level, three bedrooms upstairs and another bedroom/craft room in the walkout basement, it offers a unique floor plan flexible enough for virtually any family. The mahogany entry door will lead you into the pretty entry foyer and soaring two-story great room, with a massive window at the rear and brick corner fireplace. There's a formal dining room delineated by beautiful columns, an updated granite/tile kitchen with two pantries, eat-in space, a coat closet and maple cabinets. More> (The larger pantry used to be the laundry, and still has W/D connections if you prefer to use it that way.) The private master has a barrel ceiling with indirect lighting and lovely millwork, adjoined by the ensuite bath with nice walk-in, and separate whirlpool/shower combo. A pretty full bath near the entry serves the front bedroom and your guests. Upstairs, you will find three large bedrooms (each with double closets) connected by a catwalk over the great room, and another full bath. The walkout basement is a stunning second gathering space, with half bath and a bedroom/craft room at the rear. There's ample storage space (around 700 square feet) and another set of laundry hookups in the basement, if you want to locate your laundry there. The kitchen walks out to a second-level screened/enclosed deck with artistic patio below. Kitchen appliances will remain except for portable microwave. Sited on a cul-de-sac, this home is absolutely immaculate and has been well-loved by its current owners. Please call for an appointment today! Directions:Westport Rd to Maple Forest, L on Willow Forest Dr, then 1/4 mi and L on Cedar Forest Pl to home. SchoolsClick map icons below to view information for schools near 4820 Cedar Forest Pl Louisville, KY 40245.